Last time on A Colorist Asked… What’s Your Motivation? Pt. 1, I was answering some of Netta-Ida M.’s questions about what it’s like as a coloring book Author, creating coloring images. Today’s installment includes the rest of her awesome questions. 4. Do you think you have different relationship with your colorists and your other audience? I definitely do think I have a different relationship with my colorists than, let’s say with my fiction audience. My fiction fans were along for the ride when they were reading my stories. Never really having a chance to ask questions about the characters and the things that happened to them. Colorists on the other hand, have a more interactive role with my art. They get essentially an outline from me and then have the opportunity to fill in the blanks and write the story of the image I’ve presented to them. I’m perpetually amazed at how I can give the same image in a contest and have 20 different renditions of it. That’s a very different interaction than with my fiction audience, who are just waiting on baited breath for the next plot twist in my story. With Colorists, it’s Our story. And that’s really neat. 5. Do you ever think what is the difference between seeing and coloring your work? Absolutely. When I create the images, they are finished blank beginnings. It’s not until a Colorist shares their work with me that I think I actually get to “see” my art for what it is. I am *always* astonished when I get a colorist completed piece back. You would think after seeing over 255 completed pieces that I would get tired of seeing them, but no. Each piece is like new eye-candy, a never before considered rendition. 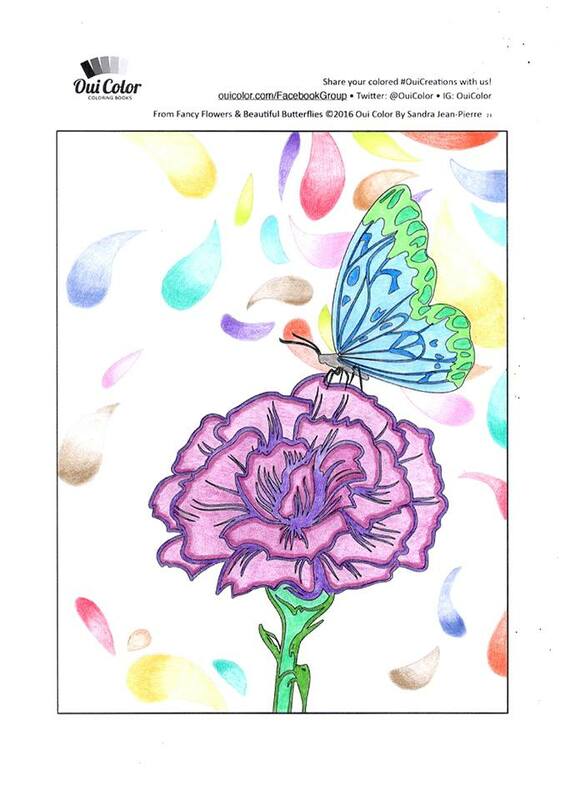 I run bi-monthly contests and challenges in my Oui Color Coloring Books Facebook Group and just this morning, I was checking the entries and I ran across a completed piece from my upcoming book Fancy Flowers & Beautiful Butterflies that totally changed my mood. I mean, I sat in front of my computer screen and just marveled at how Stacey thought to choose those particular colors, to use that particular shading technique, to, in the end give it that particular ambiance. I am moved by every single piece that is completed and shared with me. My OuiCreators are talented and awesome. I’m not sure they realize how much joy their completed pieces bring me. Truly. When I color my own images? I am generally critiquing what I’ve done, and trying to get into the headspace as if I were an avid Colorist, to see if I would like my own designs. Once I get through that initial critique, I ease into coloring and it relaxes me so much that it’s hard to pull myself away and go back to creating! 6. …but yeah, the motivation question is the most important one, what are you aiming to give or communicate through making pages for others to color? I am aiming to give a part of my talent. It’s the best feeling in the world to give someone something that comes from that creative part of You, as a creative entity. I may not be great at a lot of things, but if I can share a part of my talent, it’s a good day. I hope to lend inspiration. A lot of times Colorists’ are “going through it” with life. Bad situations, awful day, etc… and if I can inspire them through my art to keep going or to at least have a sense of accomplishment by finishing a piece? I’m ahead of the game. I also hope that I am bringing a moment of peace into the lives of those who purchase my books. Personally, I am not able to go on long vacations anymore, or able to go hiking or anything like that, but if one of my pages can give a OuiCreator just an hours worth of peace from their busy, hectic, full lives – that is gold to me. And I hope to them too. So that concludes the first ever, A Colorist Asked… segment! If you have any questions that you’d like me to answer, just send them to Sandra @OuiColor.com and be sure to place “A Colorist Asked… – Question” in the subject line. Your question might just be featured! But don’t fret – there were more questions and I’ll be answering some of those in the next installment. So be sure to sign up to the newsletter so I can let you know when the next installment will be available. And if you have not already signed up for the newsletter, you get a bonus if you do – so sign up here! I have a lot of interesting coloring related articles scheduled – so again, stay tuned and send me your questions! Remember to check out the Marketplace for any of the items mentioned in this post. See you in a few days with another article! Affiliate Disclosure: In the spirit of full disclosure, I use affiliate links for my books and the items I recommend. Which means that I may get a small commission if you decide to purchase anything from the Oui Color Coloring Books site. I only recommend products &amp; systems that I use and love myself, so I know you’ll be in good hands and you’ll never be charged more. I did every thing I was asked to do and I keep getting sent back to the page to enter my e-mail address and name. I’ve tried a couple of times with the link from the e-mail and it does the same thing. Can you tell me what I’m doing wrong please. Hi Carla! I’m sorry you’re having a hard time with the download link. Have you checked your spam folder for your confirmation email? If you’re still having issues after confirming your subscription, please email Sandra @OuiColor.com.